Create more engaging and interactive communication experiences for your events, helplines, or support services. Easy-to-use text messaging software for audience engagement. With no apps to download, no microphone lines or passing out paper, Mosio Q&A enables you to create more interactive experiences using the most popular function on a mobile phone: text messaging. Creating a more interactive experience for everyone, questions can be posted before, during, or after your event. Easy setup, friendly tech support with a free trial so you can test it before your event, ensuring it works the way you want. Cheaper, more accessible, and less complicated than mobile apps or audience response systems clickers. Perfect for all sized events. 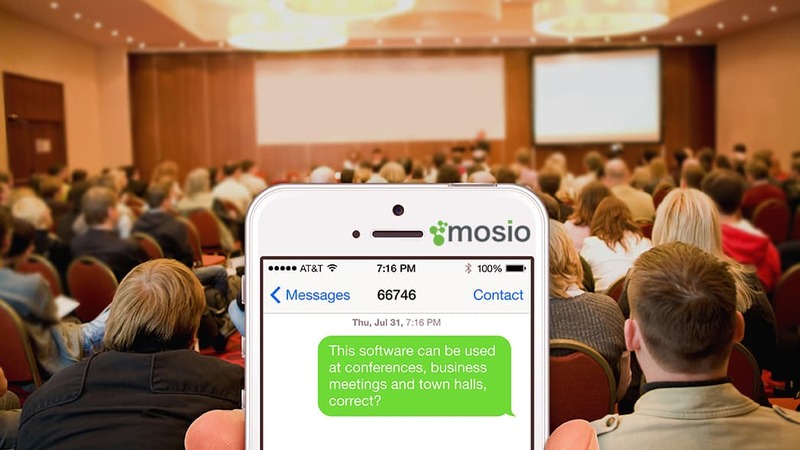 Mosio Q&A enables you to provide audience Q&A sessions, live polls, or surveys at events, conferences, town halls, and company meetings, empowering your audience to ask (and answer) questions via text messaging from their mobile phones. Add your own look and feel with a custom header in the navigation, moderate questions before they show up on the screen, or even use our “Host Post” option where you can type questions and have them display. Encourage input from every audience member, not just those willing to raise their hand or stand up at a microphone to speak. Mosio’s system is web-based and easy to set up, all you need is a laptop and internet connection. Your event’s texting number can be advertised in printed materials or on your website to encourage questions to be asked ahead of time. You can have a single system for your main event room or separate systems for break-out Q&A sessions and rooms (inquire about discounts for multiple systems). Did you know recent studies show that 92% of the online population uses emojis? They’re a powerful communication tool, with research reporting that 62% of adults over the age of 35 consider themselves “frequent users.” The Mosio system supports them, so your audience can add a little flair and creativity to their questions or comments. Receive and respond to questions via text messaging on a secure, web-based dashboard. 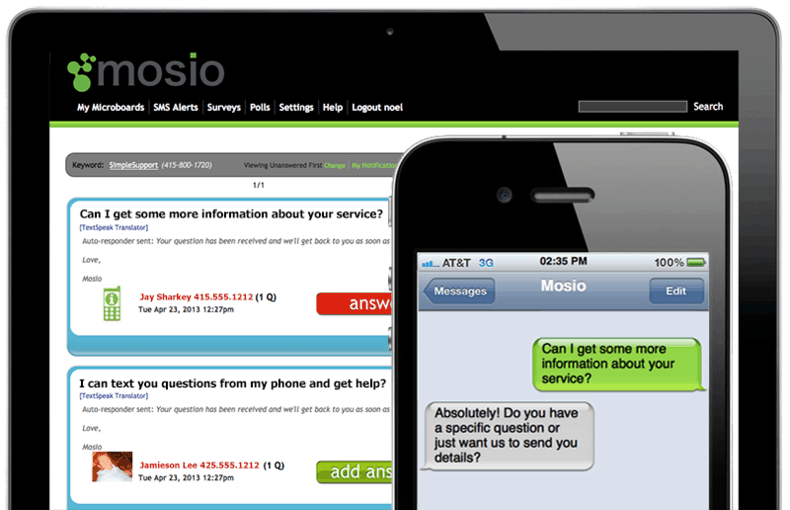 Mosio enables you to receive and respond to questions or comments via text message. You can communicate 10-15x more efficiently than phone calls using mobile’s most popular channel. One staff member can assist multiple users simultaneously and spend less “talk time” without a reduction in communication quality. TextChat is perfect for hotlines and helplines, customer support, or as part of dispatch communications for work forces. Attendees text mobile photos to show up on the projected screen or monitors around your event. Add more life and personality to your event with photos. Mosio’s text-to-screen system enables your live audience to take photos with their mobile phones and post them to your screen. Photos are moderated and selected to show up on the screen. The mobile photo feature can be used for idea generation, scavenger hunts, team building exercises, or to encourage engagement by showing photos posted on monitors or other screens throughout your event. 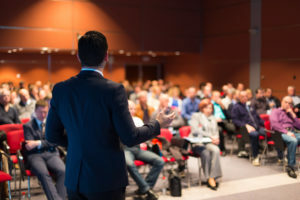 Deploy surveys before, during, and after your events to gather great information from your attendees. Deploying surveys and polls to your audience is completes the loop for a truly interactive event. 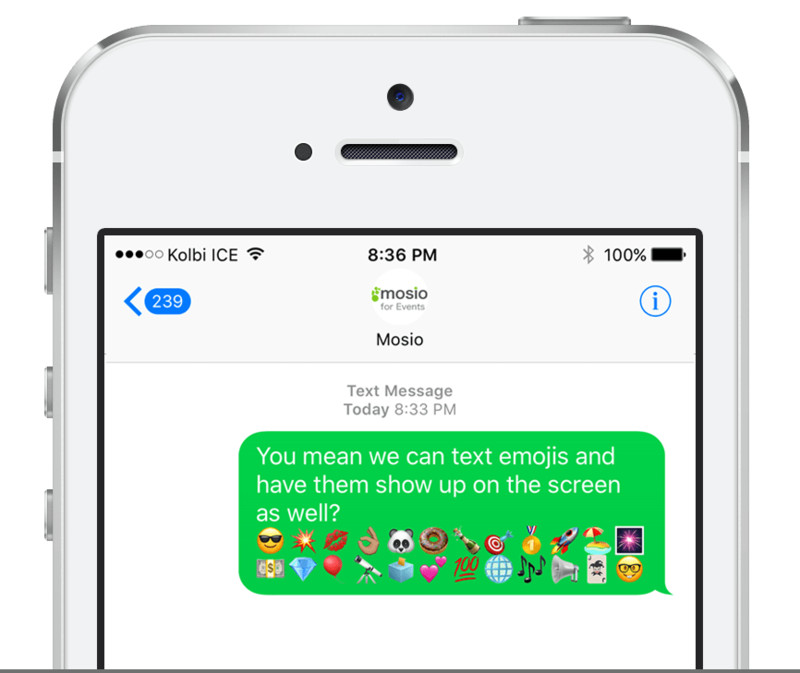 Enabling them to ask questions via text messaging is just the beginning with Mosio. Whether you are looking to offer live polls, an easy to use audience response system, text message surveys, or audience voting, our system enables you to do it with ease. Using Mosio, you can send out an SMS survey before and after your event. Then, at your event, you can offer polls on different screens or monitors around the event, literally offering polls everywhere. We count by attendees and number of surveys, not by responses, text messages, poll questions, or number of survey answers. Your survey or poll can include as many questions as you like. 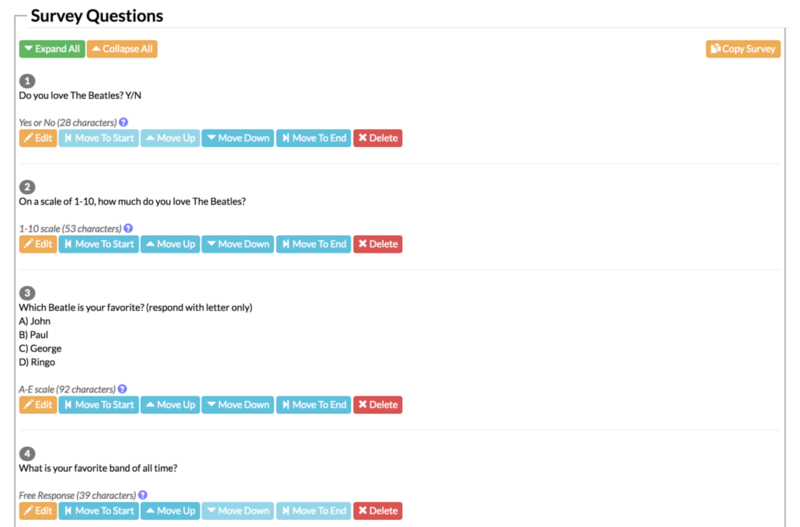 While other services may only let you have one poll question for a poll, with Mosio you can ask as many questions as you like, providing you with the ability to gather as much information as possible from your attendees. Try it now! Text SURVEY to 415-802-0099 from your mobile phone (US and Canada only). Our surveys module is web-based and easy-to-use, giving you the ability to create surveys or live polls on the fly. Collect opinions, data, and ideas efficiently using our web-based surveys module. Download the collected data via excel for use later. If you’re looking to post survey or polls results onto a screen (or screens), Mosio makes it easy by providing you with a different display page for each survey or poll. Attendees text from their mobile phones the same way they communicate with friends and family. No smartphones or downloadable mobile apps required. Your users send and receive text messages via their mobile phones. You receive a dedicated texting number and have your users/customers/attendees text directly to that number. 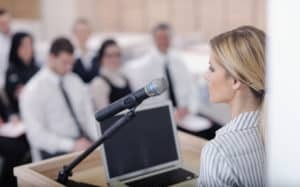 If you’re going to project questions up onto a screen at an event, they can be moderated and then selected, giving speakers or session moderators control of which questions show on the screen. We provide you a web-based widget for international or virtual attendees using their laptops, smartphones, or tablets. You simply advertise your dedicated texting number on flyers, newsletters, websites, etc, and ask users to text you the same way they do friends and family. At events, the display offers clear instructions for attendees, tech-savvy or not and a variety of options to customize the colors to go with your event’s theme. Whether out in the world or at a live event, your users can take and post photos with their mobiles (also moderated) to be seen inside the system. They can also be projected up onto a screen if being used for an event, conference, or meeting. Export questions and survey/poll responses via excel file after the event. Use for post-event follow up and respond to questions not answered live. From small teams to large groups, we’ve got you covered. Receive (and/or respond) to text message inquiries. Use in the exhibit hall or speaker rooms for Q&A. Deploy audience surveys and polls before, during and after your event. Give employees or members an easy way to ask questions. Encourage questions, feedback, and ideas. Moderators can approve messages before posting. Mosio Q&A is used by these wonderful organizations to improve their communications with interactive, audience Q&A, text-to-screen software. Experience improved audience engagement! Sign up for a free, 14 day trial to see how. Mosio is two-way text messaging software enabling organizations to communicate more efficiently with their audiences.